Matias is known for their mechanical keyboards, and — unusually for mechanical or ergonomic keyboards — available Mac key layouts and function keys. I’ve been looking forward to their first ergonomic keyboard for a while, and it’s finally here: the $200 Ergo Pro. Ergonomic keyboards are always compromises. Usually, you need to choose between annoying non-standard key layouts, miserably mushy keyswitches, or ugly, clunky designs — sometimes all three. I’ve needed to use them to keep RSI at bay for the last decade, and I’ve never been completely satisfied with any of them. The closest I’ve come to keyboard satisfaction is the $60 Microsoft Sculpt Ergonomic, which is very good overall, but has slightly mushy keys and a few non-standard key-layout annoyances (of course). The Matias Ergo Pro strikes a similar balance. It’s very good overall, but with a few drawbacks. 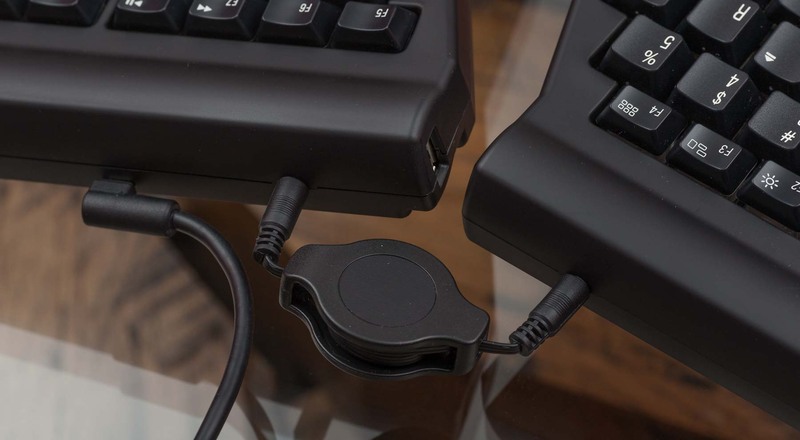 Unlike the Sculpt’s one-piece design, the Ergo Pro’s two halves are physically separate and connected by a cable. This is a mixed bag: it provides flexibility, but it’s also frustrating to have no way to lock in your preferred setting, leaving you to figure it out again whenever it’s moved. 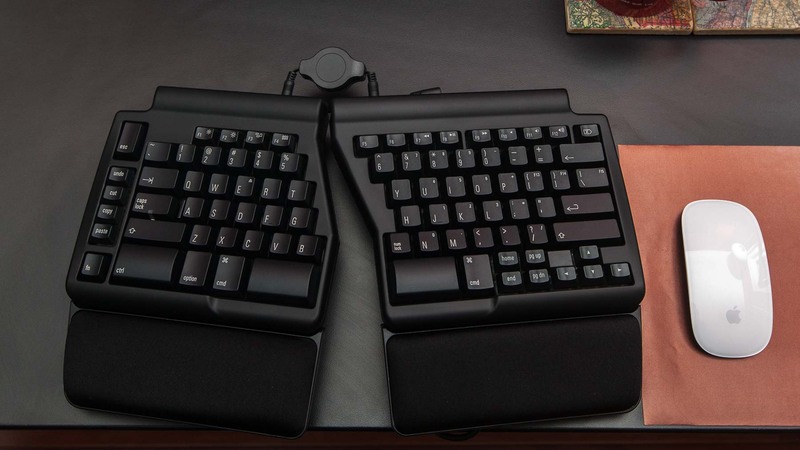 Fortunately, the split-halves design on the Ergo Pro stays in place much more than the frustratingly flimsy Kinesis Freestyle 2 because the Ergo Pro is much heavier with more stable feet. If you’re going to have disconnected halves, this is the way to do it. It’s wired, so it doesn’t make for as clean of a desk as wireless models, but it’s also much more reliable. I’ve had occasional flakiness and reception issues with the wireless Sculpt, and ultimately I prefer the reliability of a wired keyboard if given the choice. My trick for a clean desk with a wired keyboard: tuck the wire under the keyboard, around the front lip of the desk, and clip or tape it to the underside of the desk running straight back. Unusually, the USB cable is standard and removable, and the Ergo Pro even comes with two different lengths. And since it’s wired, it can conveniently offer three extra USB 2.0 ports right on the keyboard — a rarity these days — although one of the three ports is puzzlingly located, facing directly into where the other half of the keyboard is likely to be. The two halves of the keyboard are connected by a removable cable on a self-winding spool with 4-conductor TRRS male plugs on each end — the same connectors at the end of headphones with inline smartphone remotes. This is an unusual cable, but also cheaply and easily replaceable online, which is a very nice touch. But the supplied TRRS cable and spool are bulky and ugly — I’ve ordered one of many mysteriously cheap alternatives with right-angle plugs to tidy up the look a bit. The main cable, left, with a right-angle Micro-USB plug. The halves connect with a spooled headphone-like cable, center. Above it is the USB port bizarrely facing into the center gap. Each half of the Ergo Pro has three flip-down legs that can be used in combinations to create either flat, negative tilt, or tented alignments. Negative tilt means the keyboard slopes downward from front to back, rather than the much more common inverse. Tenting means the middle of the keyboard is elevated higher than the left and right sides (like a tent). Both are widely regarded as ergonomically healthier keyboard shapes. The negative tilt is pretty subtle, and it feels weird without tenting. I didn’t find negative-tilt mode comfortable, so I switched to tenting mode pretty quickly. You can’t use tenting and negative tilt together, which is unfortunate — neither mode alone is as ergonomically comfortable as the Sculpt for me, but a combination of both might have been. 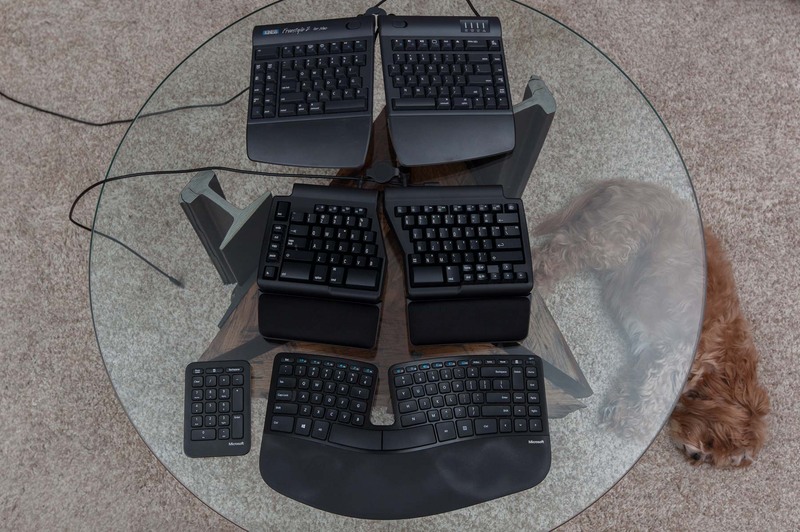 Top to bottom: Kinesis Freestyle 2, Matias Ergo Pro, Microsoft Sculpt Ergonomic, Hops. As you can see, the Ergo Pro is noticeably thicker than the others, and the keys are noticeably taller off the desk than the Sculpt’s. To use it comfortably, I needed to lower my desk by about an inch. In addition to the inability to tent and negative-tilt simultaneously, the thickness seems to be the main limiting factor for its ergonomics. It’s still better than traditional keyboards, but not as comfortable for me as the others. 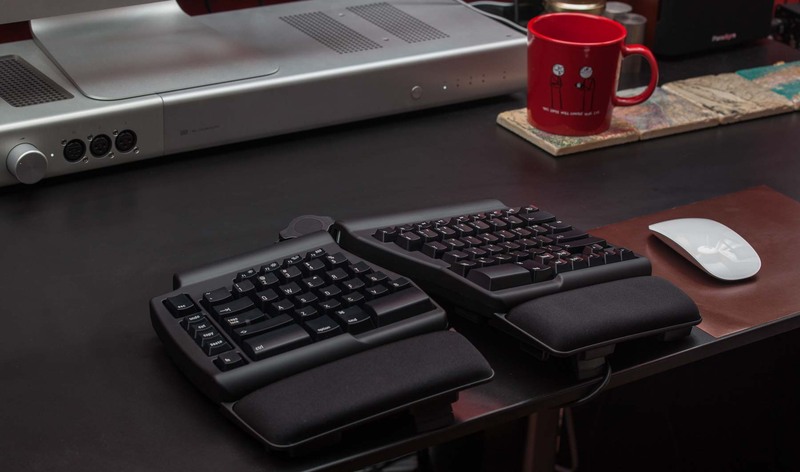 The built-in gel wrist pads are great — by far the thickest and most comfortable of the group. You’re not supposed to actually rest your wrists on them, but nearly everyone does (at least sometimes). I’ll often tend to lean forward and put an elbow on one while thinking or looking closely at the screen, and the Matias is the only one that can support that reliably: the Kinesis can’t support it at all, and the Sculpt’s stand pops off if you put too much pressure on it. Matias is known for using great mechanical keyswitches, and the Ergo Pro lives up to that reputation. These switches feel substantially better than the Sculpt’s laptop-style scissor keys or the Freestyle 2’s light-touch membrane keys. Compared to most other mechanical keyswitches, these are quieter and moderately springy. They’re still noticeably louder than laptop and membrane keys, but not as loud as common Cherry or old buckling-spring keys. Matias’ sound recordings are accurate: it’s still generally a loud keyboard, but not ridiculously so. If mechanical keyboards usually make your spouse or officemates want to kill you, a Matias keyboard might earn you a few more weeks to live. The key layout is very good, but not perfect. I wish the Escape key was in the normal position above the tilde and Fn was below Shift, laptop-style. And I’d gladly do without the action buttons on the left, the Home/End cluster on the right, and the Num Lock that turns the right half into a number pad (which I keep hitting accidentally). But these are really minor nitpicks. Given the inexplicable quirks of other ergonomic keyboards — the Freestyle 2’s non-standard Mac function keys, the Sculpt’s Esc/function chiclet buttons and Fn slider — the Ergo Pro is refreshingly normal. It’s mostly a native Mac keyboard with standard Mac function keys, and all of the functions work without installing any software. You don’t want your keyboard layout to be exciting and different, and this isn’t, thankfully. It’s a high-quality Mac keyboard, cut in half. That’s exactly what a split-ergonomic Mac keyboard should be. The Ergo Pro is very good, but so is the Sculpt Ergonomic. I thought I’d have a harder time making a recommendation between them, but now having used both, the difference is clear. The Microsoft Sculpt Ergonomic is a more comfortable ergonomic keyboard, but the Matias Ergo Pro is a better overall keyboard. The Ergo Pro has better-feeling keys, a more reliable wired connection, better function keys for Mac, and USB ports. If you want a high-quality mechanical keyboard that’s split down the middle and ergonomically better than most standard keyboards, check out the Ergo Pro. The first run is sold out, but you can preorder for expected delivery in April. Thanks to Matias for supplying an Ergo Pro for review.